Sunday was the 5th of November. Perhaps you have seen the movie V For Vendetta? The only reason I have heard of Guy Fawkes. Well, in the movie featured twice is what they call Eggy In A Basket. 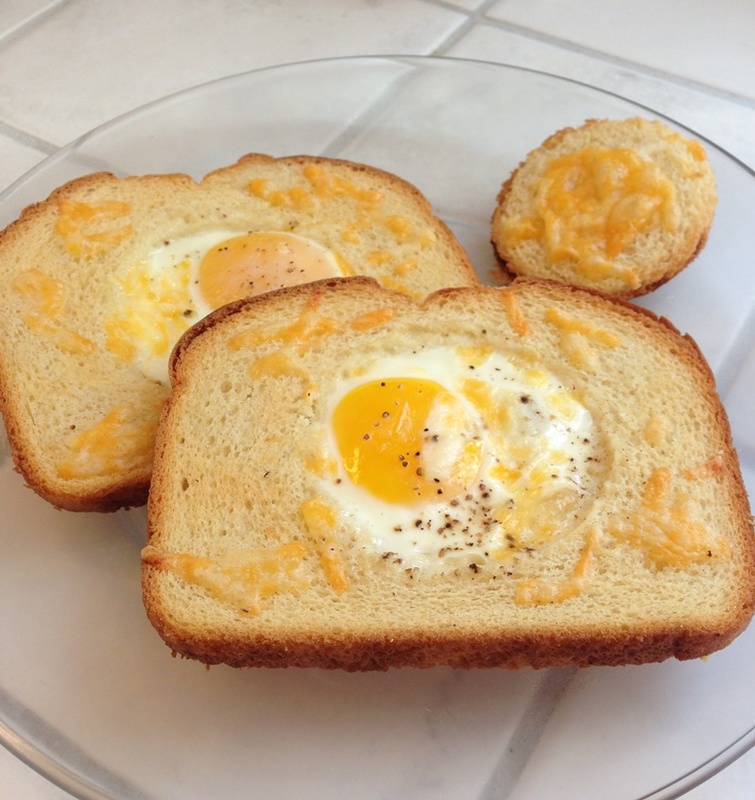 Since the bread is not really shaped like a basket and there are so many recipes where you put something – sometimes bread, sometimes meat, sometimes hashbrowns, etc. – in a muffin tin and actually make a sort of basket, I don’t feel like calling them that. But . . . I did feel like trying to make them. In the movie they make them in a pan. And my husband has made them in a pan. But I was on my way to teach a Nia class, but I wanted to feed my husband, so I needed to do it in a way that I could leave it to cook while I was “doing”. So I used the oven. You know, my favorite cooking appliance. Anyway . . . here is what I did to make it. Line a baking sheet with foil and place it in the oven. 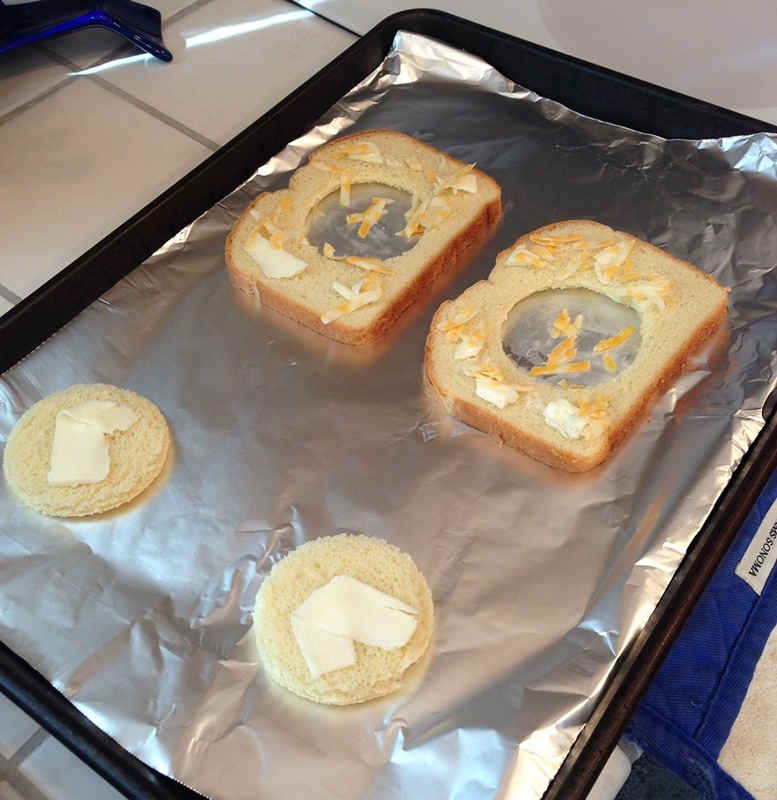 Preheat the oven to 400° F.
Using a circular cookie cutter or a glass cut a hole in the middle of the bread. Butter both sides of the bread. Take the hot pan out of the oven and place the bread on the foil. Put a little oil, butter, or non-stick cooking spray on the foil where the hole is. Then crack the egg into the hole. 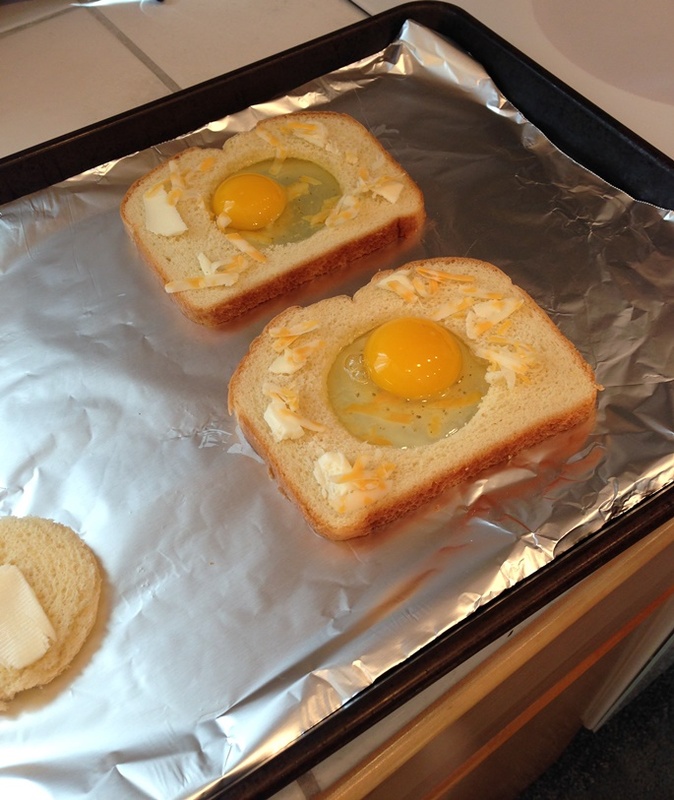 Sprinkle the cheese on the egg and bread. Sprinkle on the salt and the pepper. *for two, as you see in the pictures, double ingredients. 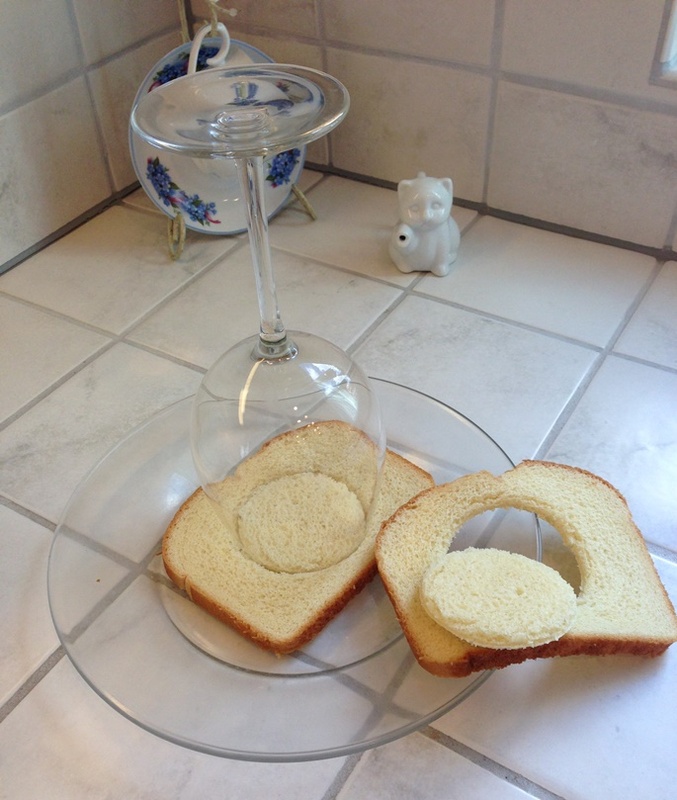 As you can see from the pictures I used a wine glass to make the circle in the bread. The rim of the glass has to be thin enough to “cut” the bread. The one glass we have that has a thin rim was too small. The other glasses that were the right size have to thick of a rim. This wine glass was perfect. It had a thin rim and was the perfect size. I don’t eat fried eggs and to me a baked egg is pretty much fried, so I didn’t have it. But my husband said it was good. It was easy, so I’ll probably make it again if he wants it. This, to me, would also make a good thing to make for a small crowd. It was really easy and it would be easy to make a dozen. Say for a brunch party. This entry was posted on November 6, 2017 at 7:48 pm	and is filed under "Recipes", Food. Tagged: easy breakfast, eggs and toast, eggs in toast, Guy Fawkes, oven baked, The 5th of November, V for Vendetta. You can follow any responses to this entry through the RSS 2.0 feed. You can leave a response, or trackback from your own site. I love these and make mine in the microwave! That might actually work better for my husband because baking them in the oven actually makes the bread like toast and he might prefer it soft. Does your bread get soft in the microwave? http://indianeskitchen.com/2017/07/31/microwave-bird-in-the-nest-toast This way he could toast it just as much as he wants or not at all. Oh, so the bread is already toasted. Cool! I will let my hubby know about this. He certainly might be interested! Thanks! This is so cool! Will try it!! I just cooked some today for my hubby. He loves ’em. I forgot to try the microwave method. The softer bread would probably be much more to my husband’s liking!